(FAIRFIELD, Conn. - February 7, 2019) – Described as a "charging bull," and noted in 2003 as one of People magazine’s "50 Most Beautiful People," Farruquito will bring flamenco to the Regina A. Quick Center for the Arts at Fairfield University on Friday, March 1, 2019 at 8 p.m.
Flamenco dancing dates back to the late 18th century. Combining cante (singing), toque (guitar), baile (dance), jaleo (vocalizations), palmas (hand clapping), and pitos (snapping), the performance of flamenco is characterized by a celebration of unbridled passion, married to intricate skill. With a family bloodline saturated in tradition and passion for the dance, Farruquito is heir to one of the most renowned Gypsy flamenco dynasties in Spain. His grandfather was the dancer El Farruco, his mother La Farruca, and his father was the singer El Moreno. Farruquito has been performing since age four when he starred on Broadway with his grandfather in the hit show Flamenco Puro . He was 11 when he appeared in a video by Camarón de la Isla, the premiere singer in modern flamenco. Two years later, Farruquito danced a soleá (a key style within flamenco) with his grandfather in Carlos Saura’s documentary Flamenco . That same year, he played the lead role in his grandfather’s Bodas de Gloria , a work based on playwright Federico Garcia Lorca’s Bodas de Sangre . When El Farruco died unexpectedly in 1997, Farruquito found himself the inheritor of his grandfather’s legacy at the age of 15. In 2001, Farruquito’s father, Juan Fernández Flores ( "El Moreno" ) died in his son’s arms during a performance in Buenos Aires. 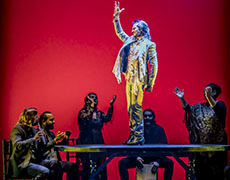 The autobiographical " Farruquito " marks the first time one of his productions carries his name. It will be presented during Farruquito’s first North American tour. Farruquito is sponsored, in part, by the Westport Inn. Tickets are $60, $50, and Quick Members are $40. For more information or to reserve your seat, visit www.quickcenter.com or call the box office at 203-254-4010 or toll free at 1-877-ARTS-396.